Jacaranda wood, patchouli and Spanish moss are infused with the sweetness of myrrh and the lingering warmth of frankincense. 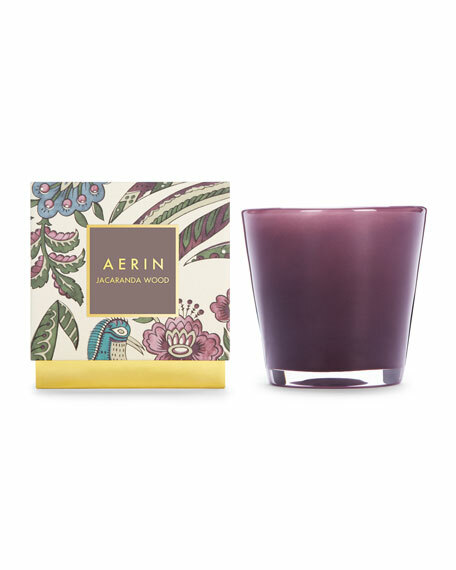 The AERIN Home Fragrance collection is defined by classic design, luxurious fragrances and unique materials. The distinctive hand-blown glass vessels are reminiscent of Aerin's collection of antique and modern Venetian glass. Decorative packaging lets a beautiful gift become ongoing storage. The collection was developed in collaboration with NEST Fragrances. 7.5 oz (215 g) for approximate burn time of 60 hours.